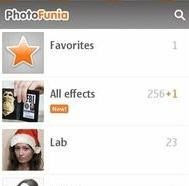 PhotoFunia is a cloud-based photo editing tool that gives you a fun filled experience. Put your face on a billboard, a stamp, or in a Warhol-like work of pop-art. Become the Mona Lisa or a bodybuilder. You get over 150 scenes to play with. You're not cutting and pasting; instead, the app "finds" the face in your photo and integrates it with the scene of your choice.